My first time hosting Thanksgiving was about 10 years ago. My parents were going to be out of town but I still wanted to get my siblings together and celebrate with all the fixings. This was back when my idea of making dinner involved taking a frozen pizza out of it’s packaging or dumping a can of cream-of-something soup over some chicken breasts so a full on Thanksgiving dinner may have been overreaching. In fact, after serving a frozen green bean casserole (my mom could have told me she used canned green beans and not frozen!!) and starting the kitchen on fire making this recipe, I’m surprised my family ever let me host another holiday. Thankfully, I’ve gotten much better in the kitchen. But every time I make this dish I have a little chuckle at myself because really…who starts their kitchen on fire making jello?!? (This girl.) 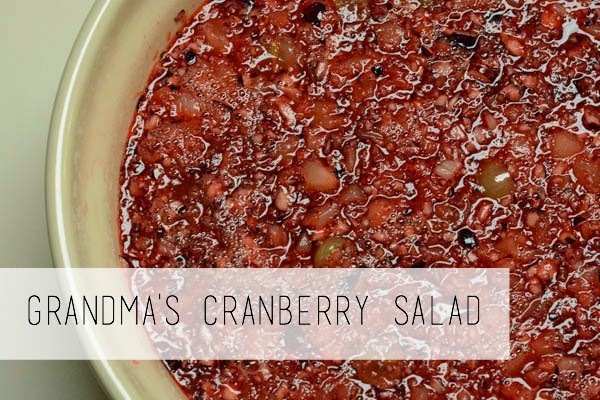 And I make this dish almost every year (unless my sister makes it) because it’s not Thanksgiving without my Grandma’s cranberry/jello salad. – Put cranberries in food processor until well chopped. Mix with 1 cup sugar. Set aside. 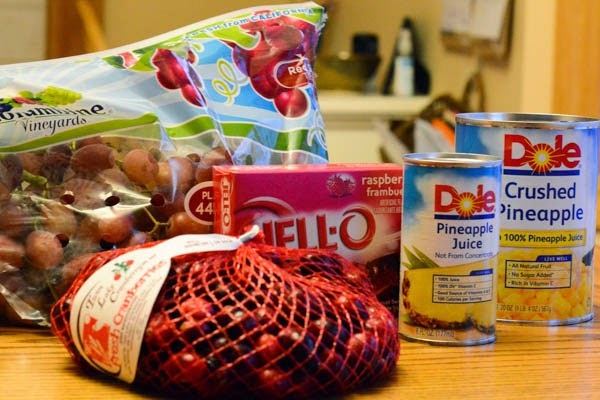 – Prepare jello according to package directions substituting pineapple juice for cold water. – Add crushed pineapple, grapes, walnuts. One bag of cranberries make a double batch so I ALWAYS just plan on doubling it. I’m never going to find a use for a half bag of cranberries and it leaves enough for breakfast – my sister and I often just plop the bowl down with spoons. I never liked cranberries as a kid but theorize that I love them now.. even though I haven't had them in years. I think this convinced me to try again. It looks great!